Mystery Plant in Tree, Plant and Wood I.D. Got some trimmings a few years ago when they were taking them out from in front of city hall. Almost grow like weeds with root runners. 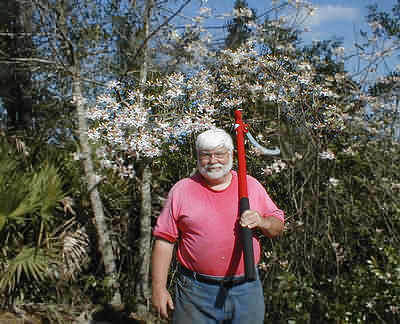 Get beautiful flowers in the spring the the leaves drop. FAst growing bugger for sure. I won't swear to it, but it looks very similar to what my local nursery refers to as wild azalea. They wanted $23 for a 2 gallon pot...I have them growing wild all over my creek. 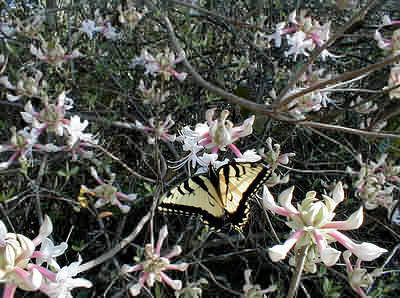 Here's wild azalea in the ditch, on the edge of my yard. Yeah, That's me and my Red Logrite Canthook. 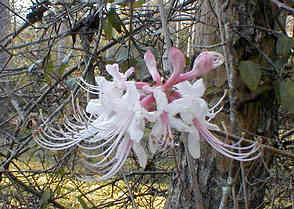 Raider, looks like some kind of honeysuckle or weigela. Although the flower arrangement favors buttonbush or onions. Weird. I've been told the are brazillian starburst but not sure about that either. They grow crazy fast and run man do they run! Clerodendrum quadriloculare (from the Philippines) is an example, hard to find much photography on the net about that genus. An example is on flickr but the forum software won't allow the link to the page. May not be the exact species, but flower looks the same. Started by danreed76 on Tree, Plant and Wood I.D. Started by Ron Wenrich on Tree, Plant and Wood I.D.